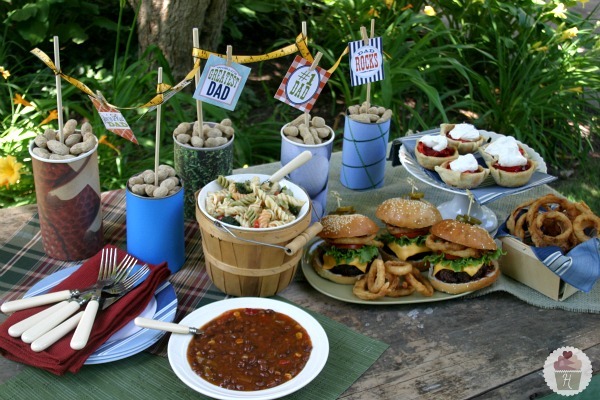 Father’s Day is Sunday…are you cooking Dad a special meal? Dad’s love Burgers and Beans! 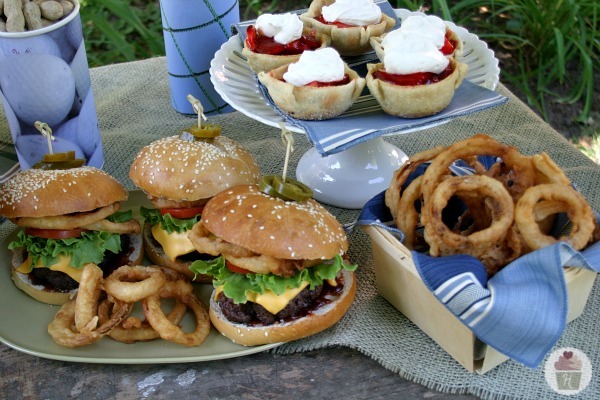 How about serving up these Cowboy Burgers with Homemade Onion Rings, Bush’s Black Bean Fiesta Grillin’ Beans, Pasta Salad and Fresh Strawberry Tarts for dessert? Grill up your favorite burger patty, I simply add a little salt and pepper to ground beef this time. 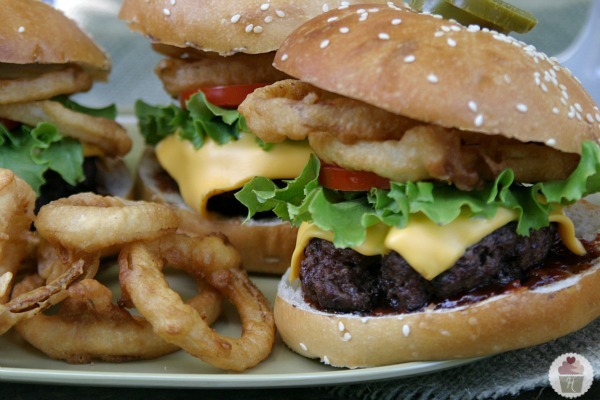 Spread barbecue sauce on a fresh bakery bun, top with cheese, lettuce, tomato and of course, the onion rings, finish them off with jalapeno slices if you like. 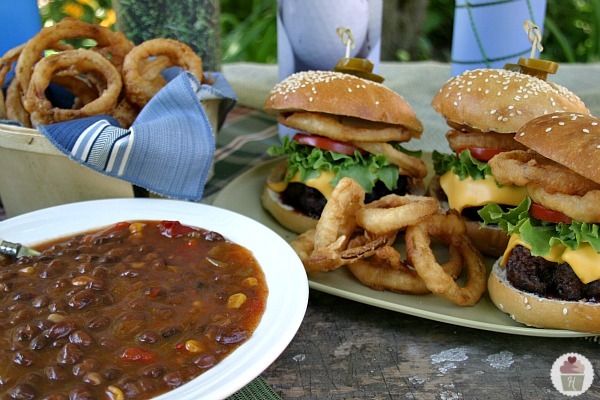 Then we need some sides…Bush’s Black Bean Fiesta Grillin’ Beans went perfect with these Cowboy Burgers! Last month I introduced you to the new Grillin’ Beans from Bush’s, there are seven new Bush’s Grillin’ Beans…Sweet Mesquite, Southern Pit Barbecue, Bourbon and Brown Sugar, Steakhouse Recipe, Texas Ranchero, Smokehouse Tradition that we served with the Grilled Butterflied Chicken, and Black Bean Fiesta. The Black Bean Fiesta Grillin’ Beans are packed with flavor, they have black beans simmered in a zesty chipotle sauce with crisp corn and red peppers. Even my picky eater loved them! Serve with Bush's Black Bean Fiesta Grillin' Beans, Pasta Salad and Fresh Strawberry Tarts for a perfect Father's Day Meal. 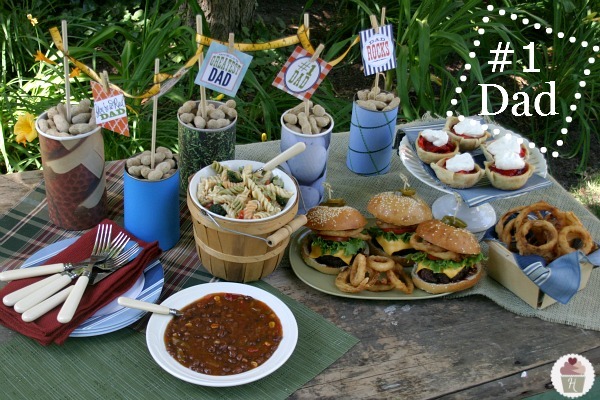 Add a yummy Pasta Salad and Fresh Strawberry Tarts and show Dad he’s #1 in your family! Visit Bush’s Beans for helpful grilling tips, new bold recipes, and meal ideas. Follow them on Facebook and Twitter too!